Image caption Is the sun setting again on hydrogen-powered aviation? It took just 32 seconds to extinguish faith in the airship and the hydrogen that once buoyed the Hindenburg, which erupted in a fatal inferno 73 years ago. Now hydrogen is being dropped again by the aviation industry. But this time the promised "green" fuel for powering flights of the future has been quietly shelved in favour of biofuels and more fossil fuel-sipping aviation. And while hydrogen as a potential "greener" fuel for foreseeable flights gets dumped worldwide, airlines and aircraft manufacturers are also jettisoning their once radical ideas for such hydrogen-burning, sci-fi-like, cryoplanes. Should we be concerned? The aviation industry clearly is. Because whatever fuel becomes the de-facto power for all tomorrow's flights the future of the passenger jet as we know it is doomed. Facing a fate shared by other fossil fuel guzzlers, the jet will have to find alternatives to burning kerosene if it is to survive beyond the middle of the next century. Which is when, according to the most optimistic figures, the Earth gives up its final barrel of oil. It was hoped that hydrogen - whose volatility so spectacularly ended the hegemony of the airship when last used for flight - would provide the fuel for the next generation of passenger jets, or "cryoplanes". Now those hopes are dashed. Three times more efficient than oil but four times bulkier - even in its liquid state - hydrogen already powers several prototype cryoplanes around the world. But despite the millions poured into research, the promised commercialisation of such aircraft has to come to nothing as hydrogen failed to prove itself any greener then other energy sources. "The energy costs of making hydrogen are enormous," Professor Ian Poll, head of technology for the UK government-funded sustainable aviation Omega organisation tells the BBC. "Currently it has to be created with an awful lot of energy. We need a source of electricity to make hydrogen that does not emit CO2, and there are not many of those around." He also points out that as world oil prices have been pegged at $70-85 per barrel, alternative fuels are simply not viable and can not compete economically. But just 12 years ago, experts and much of the aircraft industry seemed bullish about hydrogen's chances as the new super fuel. Generated from hydropower, liquid hydrogen they thought would be the ultimate non-polluting fuel source that, with some modification, be readily used by today's aircraft. Radical redesign of the world's airline fleet was planned to carry the bulky liquified gas. The result would have been new-look cryo-jets reminiscent of Thunderbird 2, with short wings and a bulging fuselage containing the liquified gas. Starting back in 2000, Airbus was involved with the 26-month EC-funded Cryoplane Project to assess the feasibility of hydrogen, in its bid to develop a zero carbon-emissions aircraft of the future. Researchers found that aircraft would require fuel tanks four times larger than today's. Models showed that the larger exterior surface areas would increase energy consumption by well over a tenth, and overall operating costs by around 5%. Despite the drawbacks, reactions from the air industry were positive, with Airbus and its partners Daimler-Benz Aerospace avowing a goal of replacing kerosene with hydrogen to run their engines by 2020. But for the aerospace giants, hydrogen's appeal is now much diminished, and the emphasis seems to be on making fossil fuels go further. "In principle it is possible to fly with hydrogen and we have a proof of concept but for the moment we can not produce enough hydrogen in an environmentally friendly manner for aviation." Where Airbus, and the aviation industry as a whole, is devoting its research is into reducing consumption further and committing to developing what it calls greener synthetic kerosene and leaner planes and engines. Hydrogen, nuclear-powered planes, solar and electric powered commercial aircraft have all been shelved for the short- to mid-term. "They must be 'drop-in' - in other words no major, if any, changes to aircraft engines and no changes to existing fuel transportation systems. Alternative fuels include coal-to-liquid (CTL) and gas-to-liquid jet fuels that are now fully certified in 50-50 blends, although CTL jet fuels have been in use at South African airports for many years." 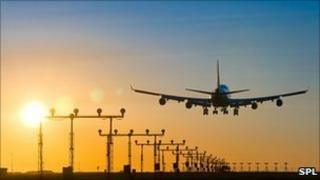 Aviation is growing at around 9% a year according to the Intergovernmental Panel on Climate Change (IPCC), with greenhouse gas emissions from aviation currently accounting for approximately 3.5% of emissions from developed countries. In addition, the impact of nitrogen oxides emissions and the impact of contrails are estimated to be "about two to four times greater than those of CO2 alone". The greening of the skies, it seems, is going to be as difficult as putting the board of British Airways on bicycles.